The Savoy Theatre is a West End theatre located in the Strand in the City of Westminster, London, England. The theatre opened on 10 October 1881 and was built by Richard D'Oyly Carte on the site of the old Savoy Palace as a showcase for the popular series of comic operas of Gilbert and Sullivan, which became known as the Savoy Operas as a result. The theatre was the first theatre, and the first public building in the world, to be lit entirely by electricity. 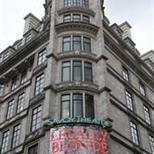 In 1889, Richard D'Oyly Carte built the Savoy Hotel next to the theatre. For many years, the Savoy was the home of the D'Oyly Carte Opera Company, and it was run by the Carte family for over a century. Richard's son Rupert D'Oyly Carte rebuilt and modernised the theatre in 1929, and it was rebuilt again in 1993 following a fire. It is a Grade II listed building. Apart from The Mikado and other famous Gilbert and Sullivan premieres, the theatre has hosted such notable premieres as Noel Coward's Blithe Spirit in 1941. In recent years it has presented opera, Shakespeare and other non-musical plays, as well as musicals, including revivals of Fiddler on the Roof and Carousel, and new shows like Never Forget. The original London production of Legally Blonde played from December 2009 to April 2012. The nearest tube station to the Savoy Theatre is Charing Cross, which is accessible from the Bakerloo and Northern lines and roughly a 3 minute walk from the theatre. Alternatively, Covent Garden tube station is around 10 minutes' walk from the theatre and can be connected to from the Piccadilly line, although this option is not recommended for those who have difficulty walking. Numbers 1, 4, 6, 9, 11, 13, 15, 23, 26, 59, 68, 76, 77a, 91, 168, 171, 172, 176, 188, 243, 341, 521 and RV1 serve the Strand. For those wishing to drive to the theatre, the nearest car park is the Trafalgar Square Spring Gardens car park. However, this can be a fairly expensive way of getting to the theatre as the tariff currently starts at 35 pounds for a day's parking and it is often busy. 2 steps into the Upper Circle, 33 steps down to the Dress Circle, 71 down to the stalls. Access through a side entrance from the Embankment side of Carting Lane. There are 2 spaces for wheelchair users with companion seating located near by. Please book disabled tickets through the venue. Radio receivers are available with head sets to collect from reception. You will need to book these in advance with the venue. Guide dogs are allowed in the auditorium or staff can dog-sit. For more information and disabled bookings, please call 0844 871 7677.